Reading the press accounts of the Iowa straw polls, anyone with any sense of proportion can't fail to be struck with how incredibly silly they are. Now, I spent a lovely winter in Des Moines back in 1983-1984. (Okay, it was just a couple of weeks in November and December, but it seemed like a whole winter.) It's a fine state full of very fine people. * And I don't say this as a knock on Mitt Romney: He and his campaign staff are to be congratulated on their win if only because it's something they set out to do, spent a ton of time and money on, and accomplished. Maybe a year from now, in hindsight, his win in the Iowa straw poll will be viewed as having been the true beginning of his roll to the nomination, and in fifteen months, maybe it will be seen as his campaign's first big step toward general election victory in November 2008. But on its own, as a national political event, the Iowa straw poll is a distraction and a diversion, important only to the extent it's dangerous, dangerous only to the extent that anyone anywhere else thinks it really mattered after it's over. I rank it right up there in cosmic significance with the cell-phone text-messaging polls on the GOP "debate winners" that Rep. Ron Paul's team have so effectively ballot-stuffed. Two-thirds of President Bush's most loyal Texas campaign supporters, whose record-breaking fundraising vaulted him into early dominance in the 2000 presidential race, remain on the sidelines in the wide-open race to replace the state's favorite son. A Houston Chronicle analysis of Federal Election Commission disclosure reports found that only 97 of the 296 Texans who pledged to raise at least $100,000 for Bush's presidential campaigns in 2000 or 2004 have donated to any candidate in the 2008 White House race. I'm no fund-raiser. I'm a partisan pundit, but I'm not much of a political donor myself. But I am very confident that I am well enough acquainted with my fellow Texans who are major political donors to say with a very, very high degree of confidence that they haven't suddenly become uninterested in presidential politics. Nor have they likely become permanently tight-fisted. Nor are they likely to sit out the 2008 presidential election. Nor are they likely to give less money in 2008 than they did in 2004 or 2000. The Chronicle's story says that Giuliani and Romney can each so far claim the backing of only around 10 percent of "Bush's Pioneers, who each raised at least $100,000 in campaign cash for Bush, or Rangers, who gathered upward of $200,000." That's notwithstanding the fact that they've both been formal candidates for months. That's notwithstanding the fact that Rudy Giuliani, in particular, is (and has been since 2005), a name partner in a Houston-based law firm, Bracewell & Giuliani. The Chronicle describes these big Texas donors as being "on the fence." That's the wrong metaphor, because it's entirely possible that an upside-down turtle balanced on a fence post might just stay there, and these folks won't. No, these donors are birds' nests on the ground waiting for someone to scoop them up — and I'm sure that the Giuliani, McCain, and Romney campaigns have been trying already, obviously without conspicuous success. Romney winning the Iowa straw poll isn't going to knock any of these donors off the fence, nor make them into suddenly graspable birds' nests. Nor will making his formal campaign announcement, by itself, be enough for Fred Thompson to suddenly acquire gluey fingers for these birds' nests either. But if Fred's the candidate I frankly hope he'll be, then someone right now in his (proto-)campaign had better be far advanced in planning for the dramatic events — well earlier than year-end or January primaries that will suddenly turn some of those birds' nests into graspable items. Texas campaign money could catch him up to his GOP competitors in, well, a New York minute. The reason I was in Des Moines in late 1983 was to represent a large health insurance company headquartered there in a nasty federal court lawsuit that was pending here in Houston. I was there producing hundreds of thousands of documents and many, many deposition witnesses (including the company CEO) as part of an extraordinary expedited discovery plan. It was in a high-profile case in which the trial judge had already announced his intention to grant summary judgment against my client, and to proceed to a jury trial in January 1984, during which he was going to instruct the jury from the outset that my client had deliberately breached its contractual and fiduciary obligations, and that the jurors' sole job was to decide how severely my client ought to be punished for that. Thus, to say that the trial was going to be an uphill battle was a considerable understatement. That made my time in Des Moines more grim than it otherwise probably would have been. As things happened, when our trial began, Houston was experiencing one of its rare genuine winter cold snaps — three or four days in a row with below-freezing temperatures, sleet, and high winds. We don't handle such things very well; there were busted pipes and fender-benders galore, all over town. On the third or fourth day of the trial, I was riding the elevator down for lunch with Craig and Sandy — he, the senior claims manager from my client who was serving as the corporate representative, and she, an in-house lawyer who was also there to observe and assist. They were both tall, clean-cut, wholesome folks in their early 30s who looked like they could have stepped right out of a Norman Rockwell painting. And they were genuinely decent and competent people with whom I'd enjoyed working even under these very challenging circumstances. With us on the elevator was one of the jurors — an elderly woman, probably in her late 70s, who was accompanied by a (non-juror) friend who'd come to meet her for lunch. The two Iowans and I, of course, clammed up to avoid any hint of improper contact with the juror, but other folks in the elevator were making predictable small-talk about just how cold it was outside. At that point, the little-old-lady juror — without ever speaking directly to us — suddenly seized the sleeve of Craig's overcoat between her thumb and forefinger, and with her other hand gestured to him and to Sandy. "These young people," she told her friend, "are from way up north in Des Moines, Iowa! Ooooh! I'll bet they know what freezing-cold winter weather is really like up there!" We all shivered involuntarily, but for differing reasons. I was afraid the juror was about to pinch one of Sandy's naturally freckled and apple-colored cheeks, and both Sandy and Craig were blushing wildly while all three of us bit our lips. My team literally fled the elevator as soon as we reached the ground floor, lest we do anything that could be deemed improper, or lest the juror stray beyond what was probably permissible (but very borderline) small-talk into outright juror misconduct. But were we heartened by the elevator incident? Oh, yeah. It was consistent, mind you, with the looks and body language we had been getting from both this juror and the rest of the jury all week — just much more vivid. And I supposed (and warned my client) that it was still entirely conceivable that this juror could still vote to punish my client with a seven-figure award, and in any event, she was only one juror out of six. But I had a hard time reconciling the hypothetical notion that this juror was eager to punish my client with her spontaneous, affectionate tug on Craig's overcoat sleeve. 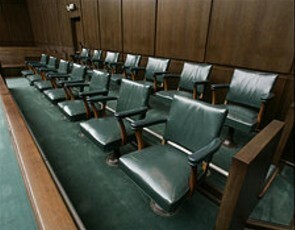 The case ended up settling while my motion for directed verdict was pending. Even two decades later, as much as I'd love to — because there are many other war stories, ranging from funny to sad and disturbing, from that case's pretrial proceedings and trial — I still wouldn't feel comfortable blogging about many of the other details of that case, or even generally describing how the settlement came about. I can say, I suppose, that we enormously improved our settlement position during the course of the trial. Yet while the elevator incident does provide anecdotal evidence that reflects well on Iowa and at least these two of its business-people, I never had the chance to find out just how appealing my corn-fed Iowans were to either that juror or her fellows when it came to answering the specific questions the judge would have asked them. It was the client's fully-informed decision to settle the case on the terms it did, and I'm confident that I did my very best in representing that client (and, indirectly, the many cheerful, earnest Iowans who worked there). Nevertheless, on a personal basis, for a variety of reasons, I've always wished the case had gone to a verdict — even though that would have meant a certain appeal, even if we'd won with the jury. I think you are right. I live in a community with many Bush Pioneers and Rangers who have not yet committed to a candidate but who will contribute to Fred Thompson if/when he announces. "I rank it right up there in cosmic significance with the cell-phone text-messaging polls on the GOP 'debate winners' that Rep. Ron Paul's team have so effectively ballot-stuffed." True, no delegates were chosen. And some serious candidates boycotted the event. But the fact that neither Ron Paul nor any other kook could stuff the Iowa Straw Poll ballot proves it is at least more meaningful than a cell-phone "poll." As an ordinary Iowan I can say the straw poll is insignificant. To the people that play politics everyday - live it, breathe it - and the media, they play it up to be much more important than it is to all of us. It is interesting to watch the pundits debate its import on a national scale. My opinion is that it only has importance in hindsight. If after the caucus or primary or even the general election pundits look back and say, "Look, he got his momentum at this point."